We proudly present our Tropical Hangout-assortment. Look here at the variations we offer to help make the Tropical Hangout fit everyone’s personal tastes and wishes. This is where it all started, the one and only Tropical Hangout | Original. An ideal Hangout for you to enjoy with friends, while having a delicious drink together, listening to some music, or the perfect spot to let your imagination take you to a deserted tropical island. This is the Tropical Hangout in its bigger form, ensuring even more comfort and relaxation. There will be enough room for even more people to get comfortable in these hammocks. So get your whole family together to hangout and enjoy the Tropical Hangout | XL. You’ve been warned, once you get in you’ll never want to get out! Are you looking for a hammock with a twist? Try out our Tropical | Air-Chair with hang chairs! This Tropical Hangout is just as relaxing as the other Tropical Hangouts, but provides a slightly different experience. Get into your own personal hammock cocoon and use this space to take some time for yourself or interact with family and friends around you. Click on the small pictures to see all designs. The Hammocks/Air-Chairs below are just an indication of what we offer, the possibilities are endless. Message us if you prefer another design and we will get back to you as soon as possible. Our most tropical hammock provides a great experience and is available in 4 vibrant colours: Red, Green, Purple and Rainbow and it is made of recycled cotton! Almost as tropical is the Hammock XL! With its large span and width it is even convenient for giants. The subtle decorations give it a luxury appearance. Although the hanging chairs are not used as much as the regular hammocks, you should definitely try them! Create your own cocoon and relax while reading a book. The world famous Guadua bamboo originates from Colombia. This is the strongest type of bamboo out there and that is why it’s known for the outstanding weight it can support. The bamboo is light in colour and gives the Tropical Hangout it’s real tropical character. The aluminium poles give the Tropical Hangout a luxury look and may be more suited in special locations like modern houses and restaurants. Another benefit of the aluminium poles is that they can be made partible, which makes it easier to transport. Also ask us about the different colour and printing options! Getting burnt in the sun while relaxing? Nobody wants that. That is why we have developed a sunshade so that you can enjoy the Tropical Hangout at any hour of the day. The sunshade makes the Tropical Hangout even more intimate, and above all it is designed to become a part of the Hangout. Climbing out of a hammock while holding on to your drink can be a challenge. Fear not, we have the solution for you! We have designed a convenient cocktail table to make sure you never face this problem again. By engraving the Cocktail Table, you make it even more special! Have you always dreamed of lying in the clouds? This dream is made a reality with our soft and fluffy cushions for extra cloud-like comfort. Let your mind and body relax in this comfy oasis. A fun alternative to the cocktail table is our rum barrel. This barrel is placed in the middle of the Hangout so that everyone can reach their drinks. As you can imagine, a rum barrel is the perfect tropical addition to your Tropical Hangout-Experience. To increase the tropical feeling of the Tropical Hangout, get yourself a bamboo fence to partition of a special space. The Tropical Hangouts and a couple of bean bags ensure a unique experience at your event. A tropical hang lounge where customers will stay for as long as they can. Use the Tropical Hangout to promote your brand! The promotional banner is a perfect way to send a message to your audience. These banners are specially integrated into the design of the hammocks, whereby it appears the banners and the Tropical Hangout are one. Subtle or powerful, we leave that up to you. Click “here” to get more information about brand activation. We hope you are just as excited as us about our product and all the possibilities. By clicking the button below, you will find the pricing Tropical Hangouts and the other products for renting, leasing, or buying. If you would like more information, or have questions about one of our products, click on the button below and contact us directly. We hope to share the Tropical Hangout-Experience with you soon! QUESTIONS? WE ARE HAPPY TO ANSWER THEM! Please leave a message below or send us an email via info@tropicalhangout.com and we will get back to you shortly! Would you like to have your answer sooner? Please call us: +31(0)620675005. 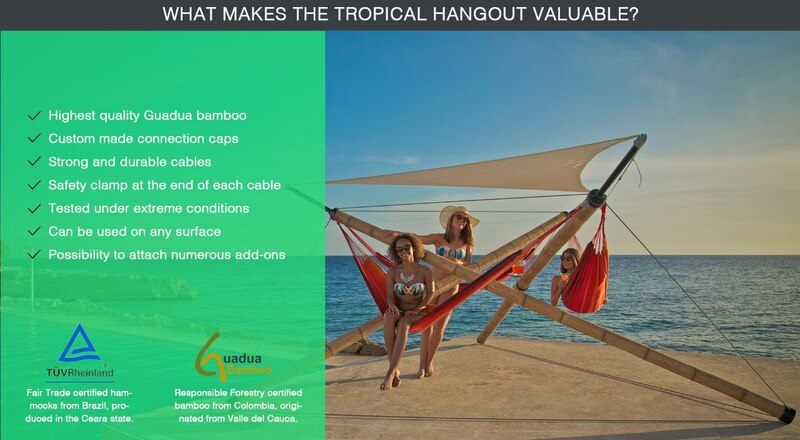 The Tropical Hangouts were invented, designed and produced by the entrepreneurs collective: 4LittleBirds, based in Amsterdam. 4LittleBirds was originally formed by four friends, all with a strong passion for: ‘Creating products that make you smile’.